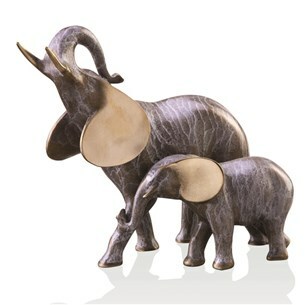 SPI Gallery, Elephant Mama and Baby Sculpture with tusk raised in brass. Approx. 7.5"h x 6.5" x 4.0"d. Meticulously hand finished using the hot patina technique with a lustrous bronze patina. SPI sticker attached on the bottom to assure authenticity.